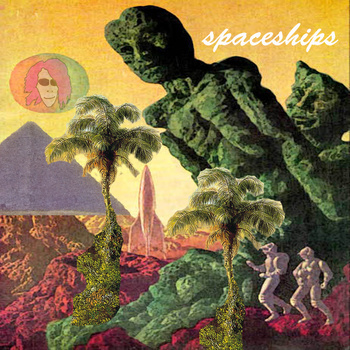 Not that anyone but the wooden actor's most devoted superfans would realize, but Cool Breeze Over the Mountains, the new debut LP from Los Angeles duo Spaceships, borrows its name from the English meaning of Keanu Reeves' Hawaiian first name. It's a downright useless bit of trivia, but indicative of the pop-damaged sense of fun working just below the album's noisy surface. Its nine tracks may be fuzzy, loud and washed out in a peculiarly stoned sort of way, but you still might catch yourself humming them in the shower, and that underlying catchiness is a big part of its considerable charm. From the beginning bars of the feet-first opener "Little", you're confronted by a sound that's bigger than it has any right to be, being made by only two people, drummer Kevin LaRose and singer/guitarist Jesse Waite. It helps that everything is slathered in reverb and distortion, but there's more than just effects at work here, a sustained musical attack that isn't aggressive as much as it is omnipresent, rarely allowing listeners to catch their breath. Whether it's applied to the punky energy of "New Wishing" or the numbed-out urban heaviness of "Limit", it lends them an arresting punchiness. If Cool Breeze Over the Mountains were any longer than its 30 minutes, that all-out aesthetic might get to be a little much, but as it stands, its range and dynamics more than carry it through, and make repeat listens an enjoyable endeavor. Beyond that, it's mostly the earworm hooks, which manage to slice right through the density of the production, as well as Waite's imposing voice, which feels right at home among it, that elevate the album above your run-of-the-mill lo-fi garage rock. It's an impressive album, though what Keanu Reeves has to do with it is anyone's guess.